As a continuation from the last post, I also made an 11" fruit tart for Father's Day. My parents had some people over because their kids weren't in town to celebrate Father's Day with them. Desserts aren't what they're into because most of the things I make are "too sweet." 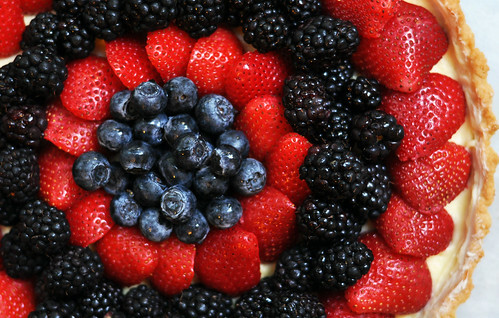 With the extra guests over and berries being in season I thought it would be a great idea to make a fruit tart. Unfortunately, I didn't own a large tart pan so I went to Bed Bath and Beyond because it was closer to my house than Chefs Toys which would have been undoubtedly cheaper. Thankfully, I had a 20% off coupon. 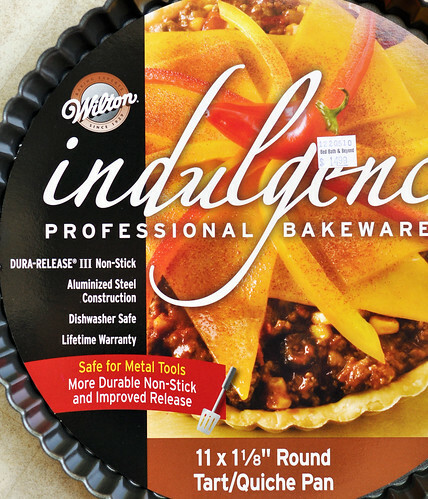 As I browsed through their baking section the only tart pan I found was an 11" coated tart pan by Wilton. I have a love/hate relationship with Wilton. They make some awesome products for various baking projects and are probably THE biggest manufacturer for home baking supplies but it's ridiculously over-priced. It just doesn't look like the things professionals would use. Having said that... I still bought it. Mainly because I didn't have the time to drive the 20 minutes to Chefs Toys. For the tart crust I used Dorie Greenspan's recipe for her Sweet Tart Dough. Since mine was an 11" I used 1 1/2 times this recipe. 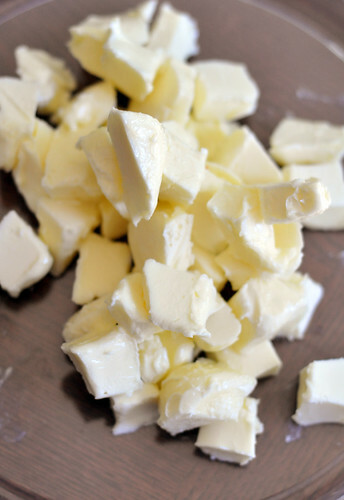 First, cut up the butter into chunks and keep them really cold. 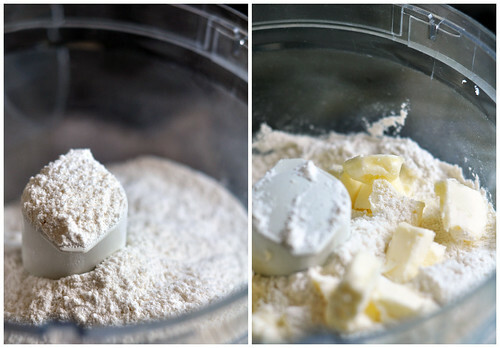 Put the flour and powdered sugar into a bowl of a food processor and pulse a few times to combine. Then spread the chunks of cold butter. Pulse until it looks like oatmeal and chunks of peas. Stir the yolk and add a little at a time. After the yolk is in pulse for about 10 seconds at a time until it forms clumps and curds. Dump this into the tart pan. Press the dough evenly over the bottom and sides. Don't be too heavy-handed. Press the dough together enough so that they stick together but not so much that it'll lose its crumby texture. Unfortunately, I did this and the crust was kind of tough. Don't do it!!! I had extra dough so I made two smaller tarts. 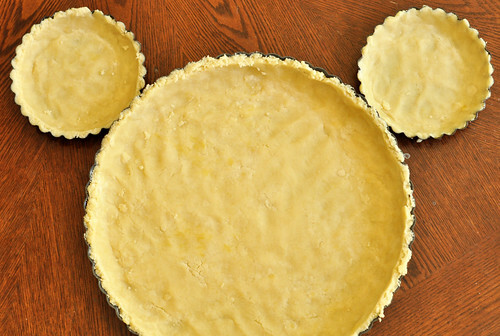 I noticed a famous cartoon character in the tart pans. Mickey's not exactly proportional but still gave me a chuckle. 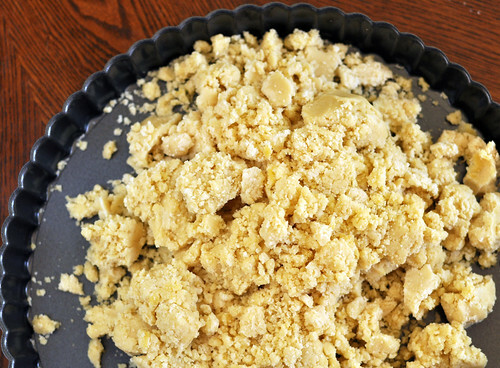 Freeze the dough for at least 30 minutes. Then preheat the oven to 375 degrees. Take aluminum foil and lightly butter one side then press that side down on top of the crust. 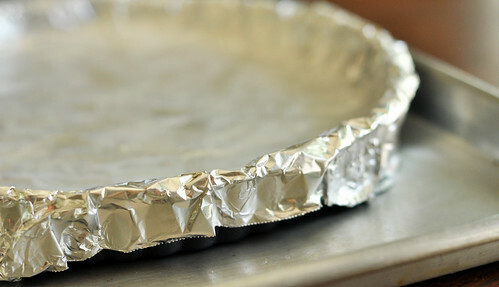 Bake for about 25 minutes then carefully remove the foil. Then bake for another 8 minutes or until it's firm and golden brown. Just keep and eye on it towards the end. It can burn pretty easily. After the crust has completely cooled, I removed it from the pan and melted some white chocolate to coat the bottom of the tart. This will help the crust stay crisp after it's been in the fridge. For the filling I used pastry cream. Here's an entry I did a while back that has instructions on pastry cream. If you don't have time to make your own pastry cream then you can always just use an instant pudding mix. You can jazz it up by using extracts or liqueur to add extra flavor. Then you arrange the fruit on top in a symmetrical fashion. We ate it right away so I didn't use a glaze. If it's going to sit in the fridge for more than a couple of hours I highly recommend glazing it. 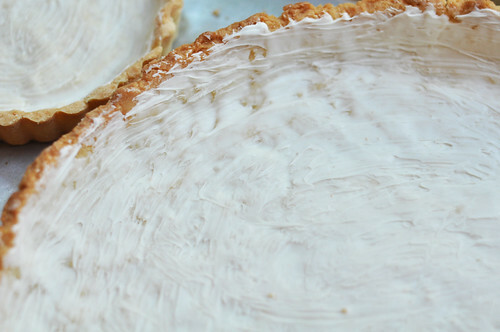 Otherwise the fruit will shrivel up.. then you have a not-so-nice looking tart. A good quick glaze is Apricot Jam/Preserves. Just mix a little bit of water to thin it down a touch then heat it in the microwave in short intervals until it's melted down enough to brush onto the fruit. What a splendid tart! 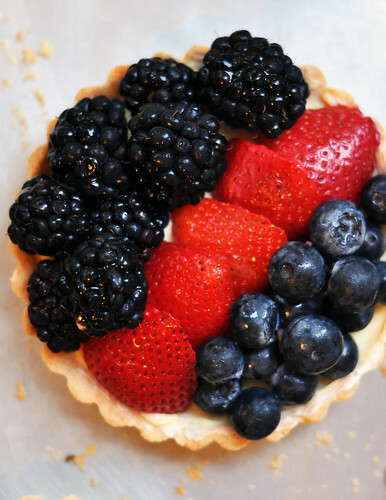 I cannot resist tarts that are made with berries and pastry cream! Pastry cream... I wanna stuff spread that stuff all over my face as moisturizer. Looks beautiful. Love this stuff! Someone open a shop & name it Tart & Pie ASAP please. dangit, my last comment didn't show up. 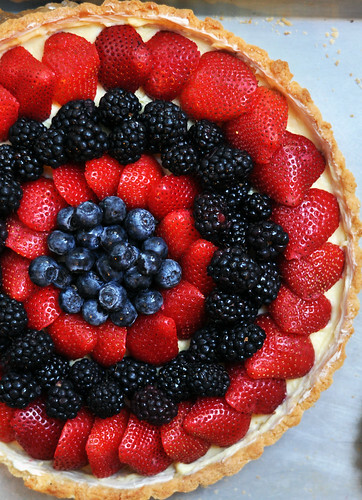 i've been wanting to try to make a tart for a while but it looked hard (esp making it pretty). i'm a little bit more encouraged though after reading your post. thanks for sharin. i esp. enjoyed that bit about the white chocolate! Oh great! I'm glad my post has made the fruit tart a bit less intimidating. Most baking seems intimidating but once you actually do it, there's not that much to it! The pan was good.. but 11 inches is HUGE. 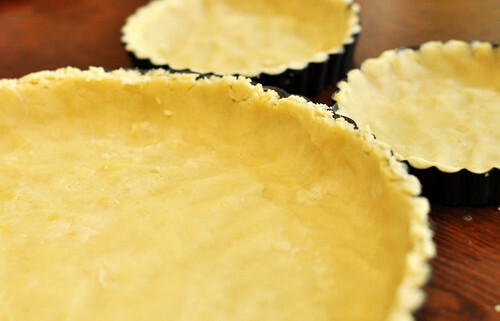 If you can find a 9" tart pan, that would be a bit easier to handle. I dropped the tart a few times because it was so huge and heavy. Let me know how it turns out if you decide to tackle it! overall though, it was a lot of fun although my tart came out ugly. i ended up getting a 8"(there was that or a 10") but in retrospect, i shoulda gotten the 10 =) def. be giving this another shot soon! Hhmm.. what was wrong with the crust? You may have over mixed it. Did you use a food processor? The result may differ if you used a mixer.